There is yojutsu and injutsu in ninjutsu. YONIN (yojutsu / yoninjutsu) is infiltration when in plain view of the people, so you are dressed like them and moving in and out of the crowd. This is where the Shinobi Nanabake (ninja disguise) was used. Many say that Yonin is only done during the day and that is wrong. You can use this tactics day or night. Yoninjutsu; is for the very highly skilled ninja. INNIN (Injutsu / Inninjutsu) is infiltration when you are not in plain view, you are staying in the shadows, not in the area of people at all, climbing on roof tops, staying in the shadows, staying in the rafters of the house to gather information, in this situation, your goal is to stay out of complete site of everyone, stay in the shadows and carry out the mission, this infiltration tactic is called Innin. Inninjutsu; is primarily used for the lower ranking ninja. Yojutsu — could be any kind of infiltration in plain view of the enemy, so the use of disguise to move through the crowd is a essential (i.e., shinobi nanabake, yamabushi, komuso, performers, fortune tellers, etc). Injutsu — is when the infiltration and information gathering is done completely unnoticed and in the shadows. So the classical black outfit, would be of use in this situation. For example, entering the enemy territory at night and hiding in the bushes during the day while observing the enemy’s movements. The lesson today comes from my own personal collection and study of these documents. All students know that one of the major documents that we use here at the school in reference to ninjutsu is the Bansenshukai. I hope that this helps with all of your training! Take Care, Be Safe and Good luck in your Journey of Budo! This entry was posted on July 8, 2011 by Soke Anshu. 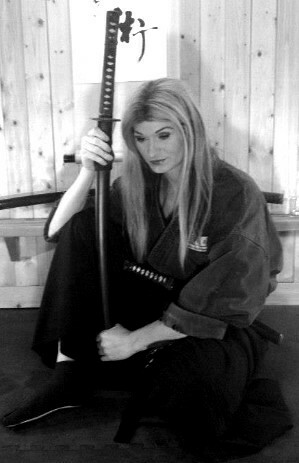 It was filed under Uncategorized and was tagged with Anshu Christa Jacobson, Authentic, bansenshukai, Budo, Budo Ryu, 萬川集海, 陽忍, 陽忍上, fujibayashi, grandmaster, Headmistress, Historical, history, Ichiro Kobayashi, Iga, innin, Inpo, Kawakami, Koga Ryu, koka koga, Koka Ryu, model, nakashima, nawa, Ninja, Ninjutsu, Okuse, Real, Ryu, Seiko, Shinobi, shinobijutsu, soke, Tomo, Tomo Ryu, Tonpo, true, yonin. Greetings and peace to you. While I possess an extremely unorthodox way of combat as well as faith in other wordly matters, my knowledge stems from pencak silat and aikido. I learned combat by being raised in combat against actual contenders- My faith is of God, of my family including fallen ancestors, of nature and of those that are good people in the world. Ninjitsu fascinates me and I have read into the subject somewhat. I believe I will focus my martial arts training strictly in this direction now. I appreciate what you have presented here. Thank you.